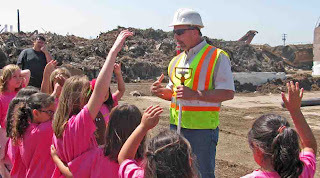 Agromin, an Oxnard-based manufacturer of earth-friendly soil products made from organic material collected from Ventura County and other Southern California communities, is accepting requests for field trips to its organics recycling facility in Oxnard. Agromin opens up its operations for schools (kindergarten through high school), nonprofit groups and youth organizations for one-hour field trips. Visitors learn how organic material is dropped off at the facility, cleaned of non-organic items, chopped, spread out in "wind rows," naturally composted by microorganisms and finally packaged for growers, landscapers and consumers. "When kids understand the importance of creating a sustainable environment, recycling and reusing often becomes a lifelong habit," says Bill Camarillo, Agromin CEO. "The sustainability message is what Agromin hopes to impart to the young visitors who come to our Oxnard facility." Organizations interested in visiting Agromin, should go to www.Agromin.com, click on "About Agromin" and then "Who We Support." Print the application form and fax it to 805-485-9222. For more information, call 805-485-9200.